Morocco is a country with a mix of Berber and Arab culture. From the Rif valley on the North to the desert in the South-East or even the Atlas mountains in the center, there is so much to discover. The variety of landscapes and the natural hospitality of its people makes Morocco an intriguing and colourful destination for less and more adventurous travellers. 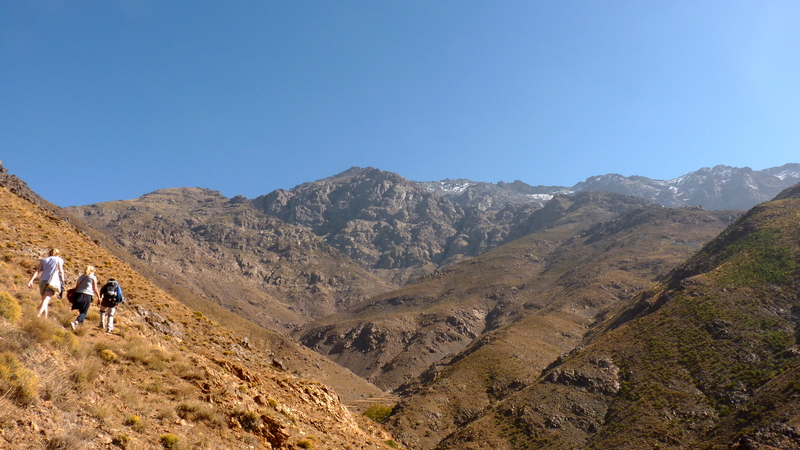 The lovely village of Imlil enclaved in the mountains allows for many breathtaking hikes for all fitness levels in the nearby valleys including climbing the Mt Toubkal which is the highest peak in North Africa at 4,167 metres. Accommodations and professional guides are easy to find and for a very affordable price. 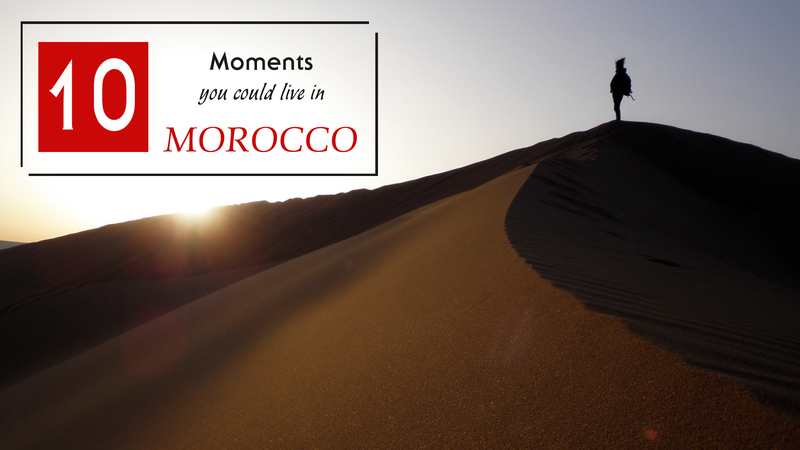 It takes only one hour drive from Marrakesh. This is the ultimate Atlas experience. Coming from Marrakesh on the way to Ouarzazate this 4hrs drive is simply magnificent. 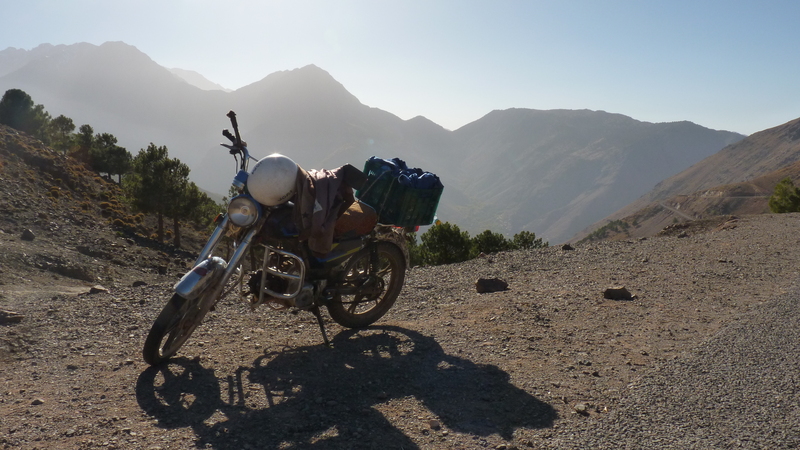 The road will take you over the Atlas mountains and then to a rocky desert. You’ll find colourful landscapes and dramatic sceneries all along the way. A must! 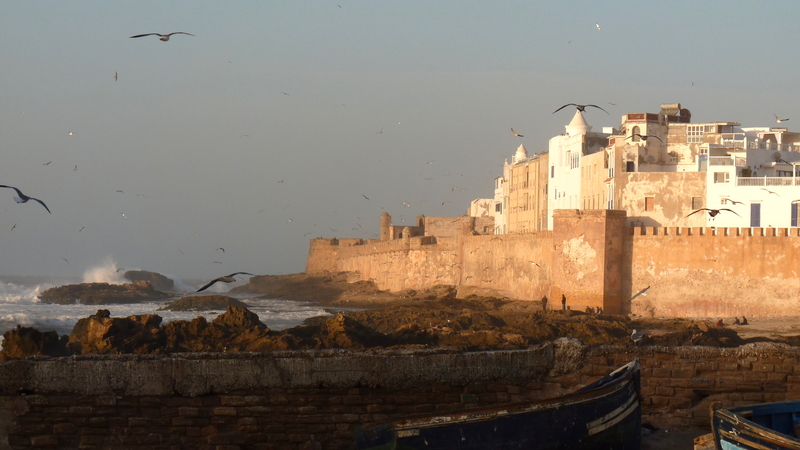 Essaouira is the best place to start or end a trip in Morocco. Also called the wind city, it is quiet and vibrant at the same time. A surfers and kite surfers paradise. The medina is a gem, you could spend the whole day walking around, going to a spa or watching the Atlantic ocean from a terrace on the top of a riad and of course go kite surfing. Don’t miss out the blue harbour where you can buy your fish and put it on the grill straight away. The Palm grove of Tinghir is perfect if you want to discover from closer how the local people live. Until you go inside, the thick layers of the palm leaves wouldn’t let you see what is going on in there. It’s amazing to watch the people harvesting on their piece of land, brings you back 100 years in time. Old abandoned kasbahs are part of the discovery as well, so don’t hesitate and step in! 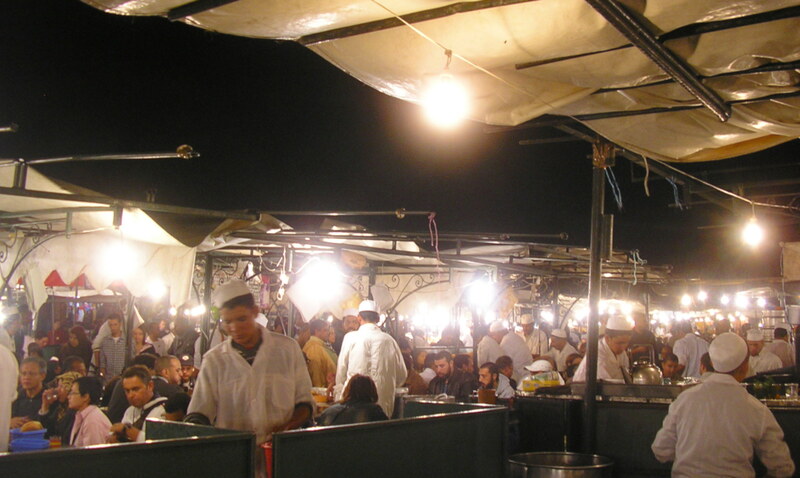 The unmissable Jemaa el-fna square in Marrakesh! Empty during the day, it becomes a huge open-air restaurant at night. The smell of the local spices is everywhere. Go and try some traditional Moroccan recipes the finger food way! This is probably the highlight of a trip in Morocco. 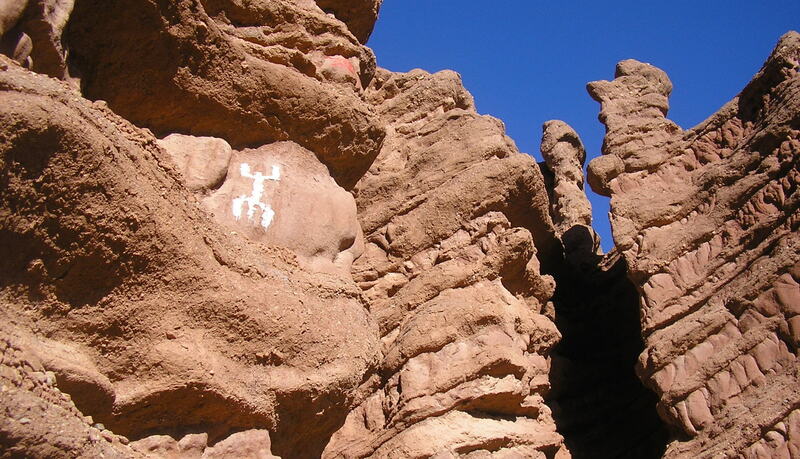 From the little town of Merzouga, it is easy to find a guide who will take you and the one you love for a magical trip into the dunes of the Erg Chebbi. 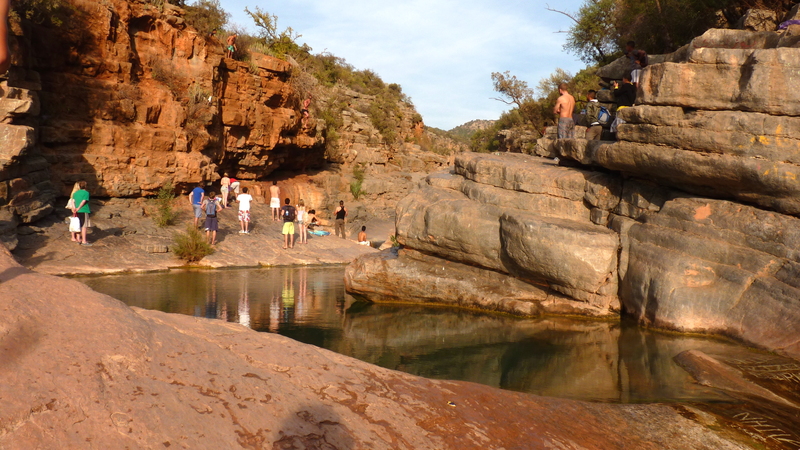 Most likely from Merzouga you’ll be able to avoid being in a big group of people. Take a camel and go at sunset. 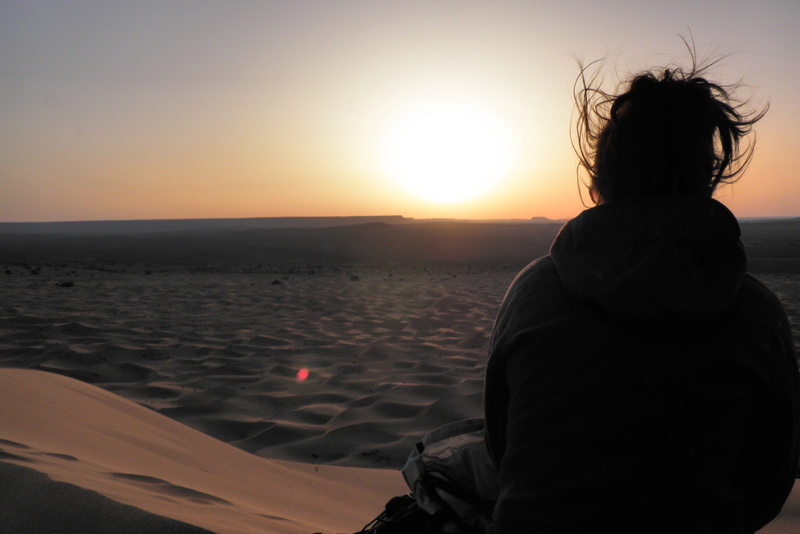 You’ll gaze at the stars at night, sleep in a traditional Berber tent and before the sunrise, you’ll walk up the highest dune to witness the most beautiful sunrise in a lifetime. 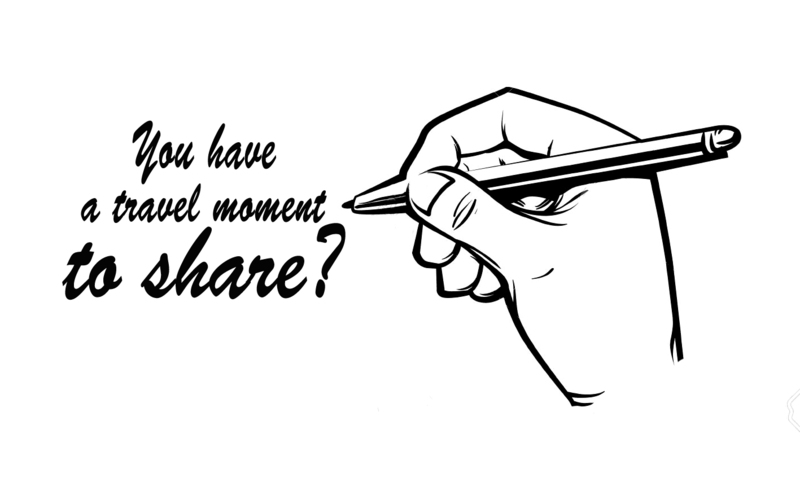 This is something you will never forget and you shouldn’t let anyone ruin that moment. (Guides sometimes want to go back before the sunrise, but you paid for that, so don’t make any compromises). The paradise valley is perfect to stay away from the beaten path and it offers a unique type of scenery. From the main road there are trails that go down the valley where the natural pools are located. The place is fantastic, several pools connected to each other with a small river stream. You can even slide between them or (for the most adventurous) jump from up to 10 meters. Being tired from the walk, don’t hesitate to stay in one of the little hotels that are next to the road, the view is gorgeous. 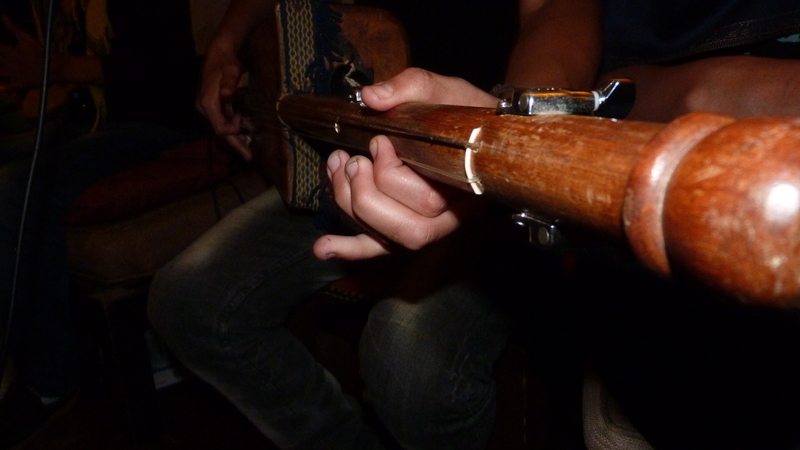 Gnaoua music is the essence of Morrocan traditional music culture. The Gnaoua music festival takes place every year in Essaouira in June. But you could easily find Gnaoua musicians all year round in some restaurants. Ask around if you are interested. Sure you’ll be able to find someone who knows where to go and be certain this is something that will please your ears. 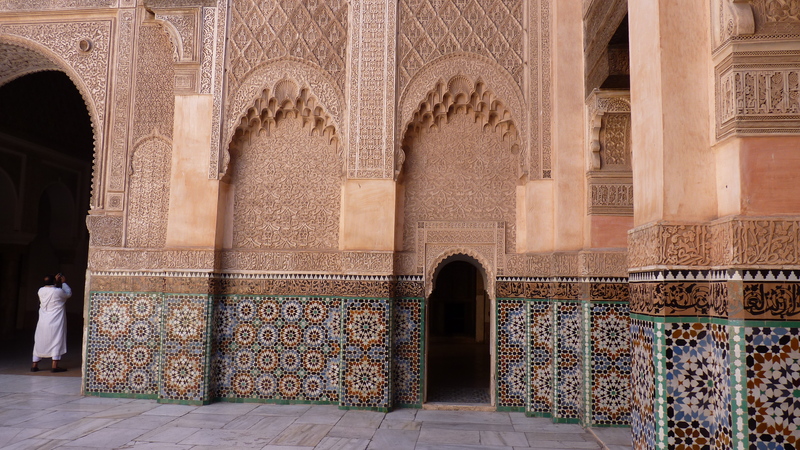 The Madrasa Ben Youssef is a jewel of the Arabo Andalucian architecture. Built in 1570 it used to be an Islamic college and was the biggest in Morocco which could welcome up to 900 students. Located in the heart of the medina in Marrakesh, the madrasa is definitely worth a visit where you’ll be able to admire the Saadian mozaic and detailed sculptured walls. 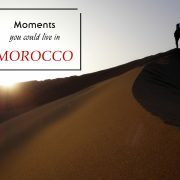 Share the post "10 moments you could live in Morocco"